These highlights do not include all the information needed to use ZYTIGA safely and effectively. See full prescribing information for ZYTIGA. Patients receiving ZYTIGA should also receive a gonadotropin-releasing hormone (GnRH) analog concurrently or should have had bilateral orchiectomy. ZYTIGA must be taken on an empty stomach, either one hour before or two hours after a meal [see Clinical Pharmacology (12.3)]. The tablets should be swallowed whole with water. Do not crush or chew tablets. In patients with baseline moderate hepatic impairment (Child-Pugh Class B), reduce the recommended dose of ZYTIGA to 250 mg once daily. In patients with moderate hepatic impairment monitor ALT, AST, and bilirubin prior to the start of treatment, every week for the first month, every two weeks for the following two months of treatment and monthly thereafter. If elevations in ALT and/or AST greater than 5× upper limit of normal (ULN) or total bilirubin greater than 3× ULN occur in patients with baseline moderate hepatic impairment, discontinue ZYTIGA and do not re-treat patients with ZYTIGA [see Use in Specific Populations (8.6) and Clinical Pharmacology (12.3)]. For patients who develop hepatotoxicity during treatment with ZYTIGA (ALT and/or AST greater than 5× ULN or total bilirubin greater than 3× ULN), interrupt treatment with ZYTIGA [see Warnings and Precautions (5.3)]. Treatment may be restarted at a reduced dose of 750 mg once daily following return of liver function tests to the patient's baseline or to AST and ALT less than or equal to 2.5× ULN and total bilirubin less than or equal to 1.5× ULN. For patients who resume treatment, monitor serum transaminases and bilirubin at a minimum of every two weeks for three months and monthly thereafter. Permanently discontinue ZYTIGA for patients who develop a concurrent elevation of ALT greater than 3 × ULN and total bilirubin greater than 2 × ULN in the absence of biliary obstruction or other causes responsible for the concurrent elevation [see Warnings and Precautions (5.3)]. If a strong CYP3A4 inducer must be co-administered, increase the ZYTIGA dosing frequency to twice a day only during the co-administration period (e.g., from 1,000 mg once daily to 1,000 mg twice a day). Reduce the dose back to the previous dose and frequency, if the concomitant strong CYP3A4 inducer is discontinued [see Drug Interactions (7.1) and Clinical Pharmacology (12.3)]. Tablets (500 mg): purple, oval-shaped, film-coated tablets debossed with "AA" one side and "500" on the other side. Tablets (250 mg): white to off-white, oval-shaped tablets debossed with "AA250" on one side. ZYTIGA can cause fetal harm and potential loss of pregnancy [see Use in Specific Populations (8.1)]. ZYTIGA may cause hypertension, hypokalemia, and fluid retention as a consequence of increased mineralocorticoid levels resulting from CYP17 inhibition [see Clinical Pharmacology (12.1)]. Monitor patients for hypertension, hypokalemia, and fluid retention at least once a month. Control hypertension and correct hypokalemia before and during treatment with ZYTIGA. In the combined data from 4 placebo-controlled trials using prednisone 5 mg twice daily in combination with 1000 mg abiraterone acetate daily, grades 3â€“4 hypokalemia were detected in 4% of patients on the ZYTIGA arm and 2% of patients on the placebo arm. Grades 3â€“4 hypertension were observed in 2% of patients each arm and grades 3â€“4 fluid retention in 1% of patients each arm. In LATITUDE (a randomized placebo-controlled, multicenter clinical trial), which used prednisone 5 mg daily in combination with 1000 mg abiraterone acetate daily, grades 3â€“4 hypokalemia were detected in 10% of patients on the ZYTIGA arm and 1% of patients on the placebo arm, grades 3â€“4 hypertension were observed in 20% of patients on the ZYTIGA arm and 10% of patients on the placebo arm. Grades 3â€“4 fluid retention occurred in 1% of patients each arm [see Adverse Reactions (6)]. Closely monitor patients whose underlying medical conditions might be compromised by increases in blood pressure, hypokalemia or fluid retention, such as those with heart failure, recent myocardial infarction, cardiovascular disease, or ventricular arrhythmia. The safety of ZYTIGA in patients with left ventricular ejection fraction <50% or New York Heart Association (NYHA) Class III or IV heart failure (in COU-AA-301) or NYHA Class II to IV heart failure (in COU-AA-302 and LATITUDE) has not been established because these patients were excluded from these randomized clinical trials [see Clinical Studies (14)]. Monitor patients for symptoms and signs of adrenocortical insufficiency, particularly if patients are withdrawn from prednisone, have prednisone dose reductions, or experience unusual stress. Symptoms and signs of adrenocortical insufficiency may be masked by adverse reactions associated with mineralocorticoid excess seen in patients treated with ZYTIGA. If clinically indicated, perform appropriate tests to confirm the diagnosis of adrenocortical insufficiency. Increased dosage of corticosteroids may be indicated before, during and after stressful situations [see Warnings and Precautions (5.1)]. In postmarketing experience, there have been ZYTIGA-associated severe hepatic toxicity, including fulminant hepatitis, acute liver failure and deaths [see Adverse Reactions (6.2)]. In the combined data of 5 randomized clinical trials, grade 3â€“4 ALT or AST increases (at least 5× ULN) were reported in 6% of 2230 patients who received ZYTIGA, typically during the first 3 months after starting treatment. Patients whose baseline ALT or AST were elevated were more likely to experience liver test elevation than those beginning with normal values. Treatment discontinuation due to ALT and AST increases or abnormal hepatic function occurred in 1.1% of 2230 patients taking ZYTIGA. In these clinical trials, no deaths clearly related to ZYTIGA were reported due to hepatotoxicity events. Measure serum transaminases (ALT and AST) and bilirubin levels prior to starting treatment with ZYTIGA, every two weeks for the first three months of treatment and monthly thereafter. In patients with baseline moderate hepatic impairment receiving a reduced ZYTIGA dose of 250 mg, measure ALT, AST, and bilirubin prior to the start of treatment, every week for the first month, every two weeks for the following two months of treatment and monthly thereafter. Promptly measure serum total bilirubin, AST, and ALT if clinical symptoms or signs suggestive of hepatotoxicity develop. Elevations of AST, ALT, or bilirubin from the patient's baseline should prompt more frequent monitoring. If at any time AST or ALT rise above five times the ULN, or the bilirubin rises above three times the ULN, interrupt ZYTIGA treatment and closely monitor liver function. Re-treatment with ZYTIGA at a reduced dose level may take place only after return of liver function tests to the patient's baseline or to AST and ALT less than or equal to 2.5× ULN and total bilirubin less than or equal to 1.5× ULN [see Dosage and Administration (2.4)]. Permanently discontinue ZYTIGA for patients who develop a concurrent elevation of ALT greater than 3 × ULN and total bilirubin greater than 2 × ULN in the absence of biliary obstruction or other causes responsible for the concurrent elevation [see Dosage and Administration (2.4)]. The safety of ZYTIGA re-treatment of patients who develop AST or ALT greater than or equal to 20× ULN and/or bilirubin greater than or equal to 10× ULN is unknown. Hypertension, Hypokalemia, and Fluid Retention due to Mineralocorticoid Excess [see Warnings and Precautions (5.1)]. Adrenocortical Insufficiency [see Warnings and Precautions (5.2)]. Two randomized placebo-controlled, multicenter clinical trials (COU-AA-301 and COU-AA-302) enrolled patients who had metastatic CRPC in which ZYTIGA was administered orally at a dose of 1,000 mg daily in combination with prednisone 5 mg twice daily in the active treatment arms. Placebo plus prednisone 5 mg twice daily was given to patients on the control arm. A third randomized placebo-controlled, multicenter clinical trial (LATITUDE) enrolled patients who had metastatic high-risk CSPC in which ZYTIGA was administered at a dose of 1,000 mg daily in combination with prednisone 5 mg once daily. Placebos were administered to patients in the control arm. Additionally, two other randomized, placebo-controlled trials were conducted in patients with metastatic CRPC. The safety data pooled from 2230 patients in the 5 randomized controlled trials constitute the basis for the data presented in the Warnings and Precautions, Grade 1â€“4 adverse reactions, and Grade 1â€“4 laboratory abnormalities. In all trials, a gonadotropin-releasing hormone (GnRH) analog or prior orchiectomy was required in both arms. 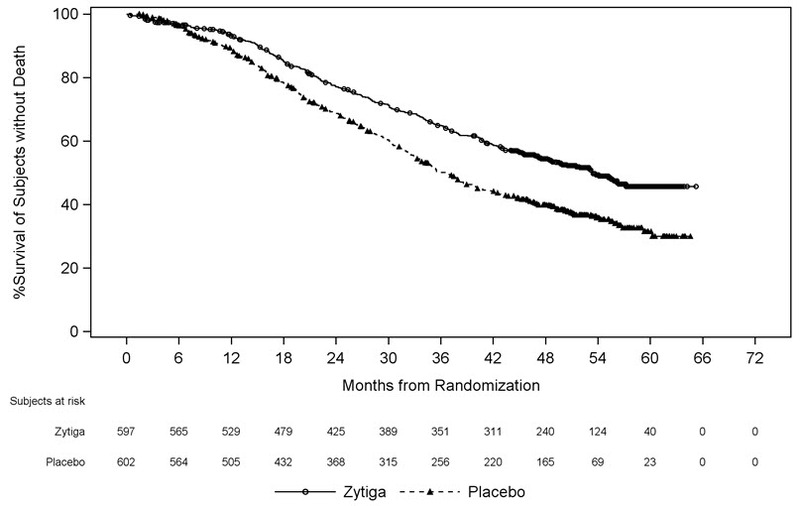 In the pooled data, median treatment duration was 11 months (0.1, 43) for ZYTIGA-treated patients and 7.2 months (0.1, 43) for placebo-treated patients. The most common adverse reactions (â‰¥10%) that occurred more commonly (>2%) in the ZYTIGA arm were fatigue, arthralgia, hypertension, nausea, edema, hypokalemia, hot flush, diarrhea, vomiting, upper respiratory infection, cough, and headache. The most common laboratory abnormalities (>20%) that occurred more commonly (â‰¥2%) in the ZYTIGA arm were anemia, elevated alkaline phosphatase, hypertriglyceridemia, lymphopenia, hypercholesterolemia, hyperglycemia, and hypokalemia. Grades 3â€“4 adverse events were reported for 53% of patients in the ZYTIGA arm and 46% of patients in the placebo arm. 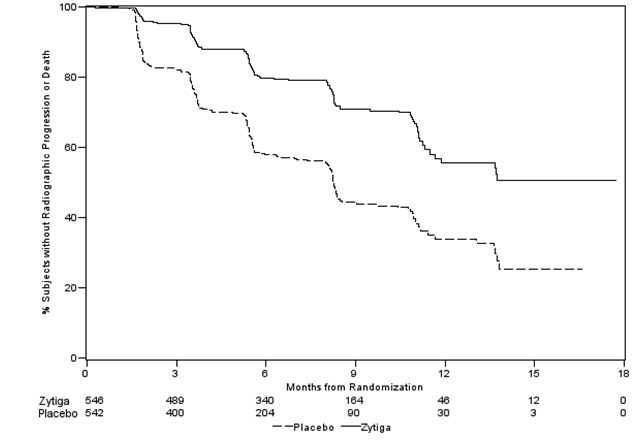 Treatment discontinuation was reported in 14% of patients in the ZYTIGA arm and 13% of patients in the placebo arm. The common adverse events (â‰¥1%) resulting in discontinuation of ZYTIGA and prednisone were hepatotoxicity and cardiac disorders. Deaths associated with treatment-emergent adverse events were reported for 7.5% of patients in the ZYTIGA arm and 6.6% of patients in the placebo arm. Of the patients in the ZYTIGA arm, the most common cause of death was disease progression (3.3%). Other reported causes of death in â‰¥5 patients included pneumonia, cardio-respiratory arrest, death (no additional information), and general physical health deterioration. COU-AA-301 enrolled 1195 patients with metastatic CRPC who had received prior docetaxel chemotherapy. Patients were not eligible if AST and/or ALT â‰¥2.5× ULN in the absence of liver metastases. Patients with liver metastases were excluded if AST and/or ALT >5× ULN. Table 1 shows adverse reactions on the ZYTIGA arm in COU-AA-301 that occurred with a â‰¥2% absolute increase in frequency compared to placebo or were events of special interest. The median duration of treatment with ZYTIGA with prednisone was 8 months. • Adverse events graded according to CTCAE version 3.0. • Includes terms Arthritis, Arthralgia, Joint swelling, and Joint stiffness. • Includes terms Muscle spasms, Musculoskeletal pain, Myalgia, Musculoskeletal discomfort, and Musculoskeletal stiffness. • Includes terms Edema, Edema peripheral, Pitting edema, and Generalized edema. • Includes all fractures with the exception of pathological fracture. • Includes terms Arrhythmia, Tachycardia, Atrial fibrillation, Supraventricular tachycardia, Atrial tachycardia, Ventricular tachycardia, Atrial flutter, Bradycardia, Atrioventricular block complete, Conduction disorder, and Bradyarrhythmia. • Includes terms Angina pectoris, Chest pain, and Angina unstable. Myocardial infarction or ischemia occurred more commonly in the placebo arm than in the ZYTIGA arm (1.3% vs. 1.1% respectively). • Includes terms Cardiac failure, Cardiac failure congestive, Left ventricular dysfunction, Cardiogenic shock, Cardiomegaly, Cardiomyopathy, and Ejection fraction decreased. COU-AA-302 enrolled 1088 patients with metastatic CRPC who had not received prior cytotoxic chemotherapy. Patients were ineligible if AST and/or ALT â‰¥2.5× ULN and patients were excluded if they had liver metastases. Table 3 shows adverse reactions on the ZYTIGA arm in COU-AA-302 that occurred in â‰¥5% of patients with a â‰¥2% absolute increase in frequency compared to placebo. The median duration of treatment with ZYTIGA with prednisone was 13.8 months. • Includes terms Edema peripheral, Pitting edema, and Generalized edema. LATITUDE enrolled 1199 patients with newly-diagnosed metastatic, high-risk CSPC who had not received prior cytotoxic chemotherapy. Patients were ineligible if AST and/or ALT â‰¥2.5× ULN or if they had liver metastases. All the patients received GnRH analogs or had prior bilateral orchiectomy during the trial. The median duration of treatment with ZYTIGA and prednisone was 24 months. Table 5 shows adverse reactions on the ZYTIGA arm that occurred in â‰¥5% of patients with a â‰¥2% absolute increase in frequency compared to those on the placebos arm. • All patients were receiving an GnRH agonist or had undergone orchiectomy. In the combined data of 5 randomized, placebo-controlled clinical studies, cardiac failure occurred more commonly in patients on the ZYTIGA arm compared to patients on the placebo arm (2.6% versus 0.9%). Grade 3â€“4 cardiac failure occurred in 1.3% of patients taking ZYTIGA and led to 5 treatment discontinuations and 4 deaths. Grade 3â€“4 cardiac failure occurred in 0.2% of patients taking placebo. There were no treatment discontinuations and two deaths due to cardiac failure in the placebo group. In a dedicated drug interaction trial, co-administration of rifampin, a strong CYP3A4 inducer, decreased exposure of abiraterone by 55%. Avoid concomitant strong CYP3A4 inducers during ZYTIGA treatment. If a strong CYP3A4 inducer must be co-administered, increase the ZYTIGA dosing frequency [see Dosage and Administration (2.5) and Clinical Pharmacology (12.3)]. ZYTIGA is an inhibitor of the hepatic drug-metabolizing enzymes CYP2D6 and CYP2C8. In a CYP2D6 drug-drug interaction trial, the Cmax and AUC of dextromethorphan (CYP2D6 substrate) were increased 2.8- and 2.9-fold, respectively, when dextromethorphan was given with abiraterone acetate 1,000 mg daily and prednisone 5 mg twice daily. Avoid co-administration of abiraterone acetate with substrates of CYP2D6 with a narrow therapeutic index (e.g., thioridazine). If alternative treatments cannot be used, consider a dose reduction of the concomitant CYP2D6 substrate drug [see Clinical Pharmacology (12.3)]. In a CYP2C8 drug-drug interaction trial in healthy subjects, the AUC of pioglitazone (CYP2C8 substrate) was increased by 46% when pioglitazone was given together with a single dose of 1,000 mg abiraterone acetate. Therefore, patients should be monitored closely for signs of toxicity related to a CYP2C8 substrate with a narrow therapeutic index if used concomitantly with ZYTIGA [see Clinical Pharmacology (12.3)]. There are no human data on the use of ZYTIGA in pregnant women. In animal reproduction studies, oral administration of abiraterone acetate to pregnant rats during organogenesis caused adverse developmental effects at maternal exposures approximately â‰¥ 0.03 times the human exposure (AUC) at the recommended dose (see Data). In an embryo-fetal developmental toxicity study in rats, abiraterone acetate caused developmental toxicity when administered at oral doses of 10, 30 or 100 mg/kg/day throughout the period of organogenesis (gestational days 6â€“17). Findings included embryo-fetal lethality (increased post implantation loss and resorptions and decreased number of live fetuses), fetal developmental delay (skeletal effects) and urogenital effects (bilateral ureter dilation) at doses â‰¥10 mg/kg/day, decreased fetal ano-genital distance at â‰¥30 mg/kg/day, and decreased fetal body weight at 100 mg/kg/day. Doses â‰¥10 mg/kg/day caused maternal toxicity. The doses tested in rats resulted in systemic exposures (AUC) approximately 0.03, 0.1 and 0.3 times, respectively, the AUC in patients. Based on findings in animal reproduction studies and its mechanism of action, advise males with female partners of reproductive potential to use effective contraception during treatment and for 3 weeks after the final dose of ZYTIGA [see Use in Specific Populations (8.1)]. Based on animal studies, ZYTIGA may impair reproductive function and fertility in males of reproductive potential [see Nonclinical Toxicology (13.1)]. No dosage adjustment is necessary for patients with baseline mild hepatic impairment. In patients with baseline moderate hepatic impairment (Child-Pugh Class B), reduce the recommended dose of ZYTIGA to 250 mg once daily. Do not use ZYTIGA in patients with baseline severe hepatic impairment (Child-Pugh Class C). If elevations in ALT or AST >5× ULN or total bilirubin >3× ULN occur in patients with baseline moderate hepatic impairment, discontinue ZYTIGA treatment [see Dosage and Administration (2.4) and Clinical Pharmacology (12.3)]. For patients who develop hepatotoxicity during treatment, interruption of treatment and dosage adjustment may be required [see Dosage and Administration (2.4), Warnings and Precautions (5.3), and Clinical Pharmacology (12.3)]. Abiraterone acetate (ZYTIGA) is converted in vivo to abiraterone, an androgen biosynthesis inhibitor, that inhibits 17 Î±-hydroxylase/C17,20-lyase (CYP17). This enzyme is expressed in testicular, adrenal, and prostatic tumor tissues and is required for androgen biosynthesis. CYP17 catalyzes two sequential reactions: 1) the conversion of pregnenolone and progesterone to their 17Î±-hydroxy derivatives by 17Î±-hydroxylase activity and 2) the subsequent formation of dehydroepiandrosterone (DHEA) and androstenedione, respectively, by C17, 20 lyase activity. 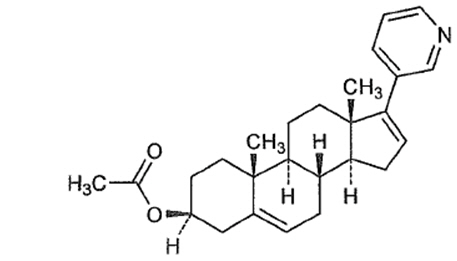 DHEA and androstenedione are androgens and are precursors of testosterone. Inhibition of CYP17 by abiraterone can also result in increased mineralocorticoid production by the adrenals [see Warnings and Precautions (5.1)]. Systemic exposure of abiraterone is increased when abiraterone acetate is administered with food. In healthy subjects abiraterone Cmax and AUC0â€“âˆž were approximately 7- and 5-fold higher, respectively, when a single dose of abiraterone acetate was administered with a low-fat meal (7% fat, 300 calories) and approximately 17- and 10-fold higher, respectively, when a single dose of abiraterone acetate was administered with a high-fat (57% fat, 825 calories) meal compared to overnight fasting. Abiraterone AUC0â€“âˆž was approximately 7-fold or 1.6-fold higher, respectively, when a single dose of abiraterone acetate was administered 2 hours after or 1 hour before a medium fat meal (25% fat, 491 calories) compared to overnight fasting. Given the normal variation in the content and composition of meals, taking ZYTIGA with meals has the potential to result in increased and highly variable exposures. Therefore, ZYTIGA must be taken on an empty stomach, either one hour before or two hours after a meal. The tablets should be swallowed whole with water [see Dosage and Administration (2.3)]. The pharmacokinetics of abiraterone were examined in patients with end-stage renal disease (ESRD) on a stable hemodialysis schedule (N=8) and in matched control subjects with normal renal function (N=8). In the ESRD cohort of the trial, a single 1,000 mg ZYTIGA dose was given under fasting conditions 1 hour after dialysis, and samples for pharmacokinetic analysis were collected up to 96 hours post dose. Systemic exposure to abiraterone after a single oral 1,000 mg dose did not increase in subjects with end-stage renal disease on dialysis, compared to subjects with normal renal function [see Use in Specific Populations (8.7)]. Abiraterone is a substrate of CYP3A4, in vitro. In a clinical pharmacokinetic interaction study of healthy subjects pretreated with a strong CYP3A4 inducer (rifampin, 600 mg daily for 6 days) followed by a single dose of abiraterone acetate 1,000 mg, the mean plasma AUCâˆž of abiraterone was decreased by 55% [see Drug Interactions (7.1)]. In repeat-dose toxicity studies in male rats (13- and 26-weeks) and monkeys (39-weeks), atrophy, aspermia/hypospermia, and hyperplasia in the reproductive system were observed at â‰¥50 mg/kg/day in rats and â‰¥250 mg/kg/day in monkeys and were consistent with the antiandrogenic pharmacological activity of abiraterone. These effects were observed in rats at systemic exposures similar to humans and in monkeys at exposures approximately 0.6 times the AUC in humans. In a fertility study in male rats, reduced organ weights of the reproductive system, sperm counts, sperm motility, altered sperm morphology and decreased fertility were observed in animals dosed for 4 weeks at â‰¥30 mg/kg/day orally. Mating of untreated females with males that received 30 mg/kg/day oral abiraterone acetate resulted in a reduced number of corpora lutea, implantations and live embryos and an increased incidence of pre-implantation loss. Effects on male rats were reversible after 16 weeks from the last abiraterone acetate administration. In a fertility study in female rats, animals dosed orally for 2 weeks until day 7 of pregnancy at â‰¥30 mg/kg/day had an increased incidence of irregular or extended estrous cycles and pre-implantation loss (300 mg/kg/day). There were no differences in mating, fertility, and litter parameters in female rats that received abiraterone acetate. Effects on female rats were reversible after 4 weeks from the last abiraterone acetate administration. A dose-dependent increase in cataracts was observed in rats after daily oral abiraterone acetate administration for 26 weeks starting at â‰¥50 mg/kg/day (similar to the human clinical exposure based on AUC). In a 39-week monkey study with daily oral abiraterone acetate administration, no cataracts were observed at higher doses (2 times greater than the clinical exposure based on AUC). A total of 1195 patients were randomized 2:1 to receive either ZYTIGA orally at a dose of 1,000 mg once daily in combination with prednisone 5 mg orally twice daily (N=797) or placebo once daily plus prednisone 5 mg orally twice daily (N=398). Patients randomized to either arm were to continue treatment until disease progression (defined as a 25% increase in PSA over the patient's baseline/nadir together with protocol-defined radiographic progression and symptomatic or clinical progression), initiation of new treatment, unacceptable toxicity or withdrawal. The following patient demographics and baseline disease characteristics were balanced between the treatment arms. The median age was 69 years (range 39â€“95) and the racial distribution was 93% Caucasian, 3.6% Black, 1.7% Asian, and 1.6% Other. Eighty-nine percent of patients enrolled had an ECOG performance status score of 0â€“1 and 45% had a Brief Pain Inventory-Short Form score of â‰¥4 (patient's reported worst pain over the previous 24 hours). Ninety percent of patients had metastases in bone and 30% had visceral involvement. Seventy percent of patients had radiographic evidence of disease progression and 30% had PSA-only progression. Seventy percent of patients had previously received one cytotoxic chemotherapy regimen and 30% received two regimens. • p-value is derived from a log-rank test stratified by ECOG performance status score (0â€“1 vs. 2), pain score (absent vs. present), number of prior chemotherapy regimens (1 vs. 2), and type of disease progression (PSA only vs. radiographic). • Hazard Ratio is derived from a stratified proportional hazards model. Hazard ratio <1 favors ZYTIGA with prednisone. Patient demographics were balanced between the treatment arms. The median age was 70 years. The racial distribution of patients treated with ZYTIGA was 95% Caucasian, 2.8% Black, 0.7% Asian and 1.1% Other. The ECOG performance status was 0 for 76% of patients, and 1 for 24% of patients. 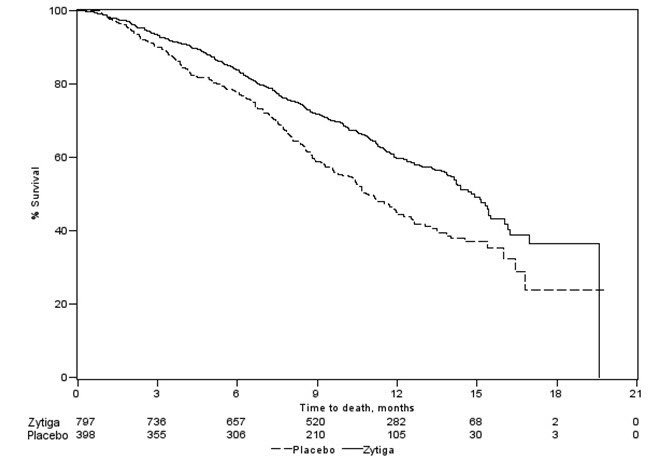 Co-primary efficacy endpoints were overall survival and radiographic progression-free survival (rPFS). Baseline pain assessment was 0â€“1 (asymptomatic) in 66% of patients and 2â€“3 (mildly symptomatic) in 26% of patients as defined by the Brief Pain Inventory-Short Form (worst pain over the last 24 hours). • p-value is derived from a log-rank test stratified by ECOG performance status score (0 vs. 1). 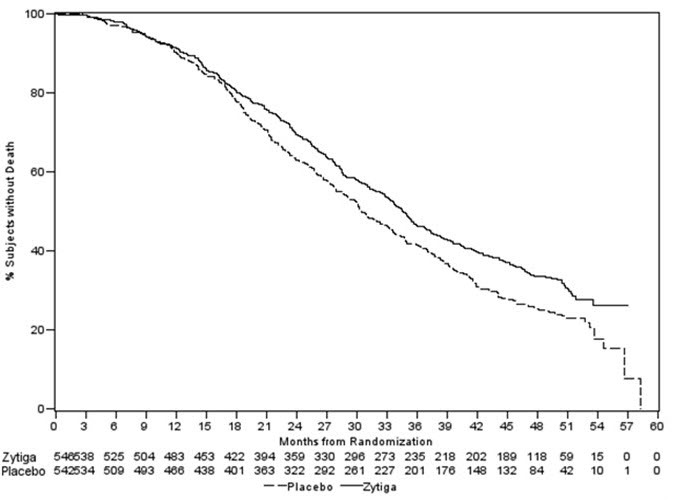 In LATITUDE, 1199 patients with metastatic high-risk CSPC were randomized 1:1 to receive either ZYTIGA orally at a dose of 1,000 mg once daily with prednisone 5 mg once daily (N=597) or placebos orally once daily (N=602). High-risk disease was defined as having at least two of three risk factors at baseline: a total Gleason score of â‰¥8, presence of â‰¥3 lesions on bone scan, and evidence of measurable visceral metastases. Patients with significant cardiac, adrenal, or hepatic dysfunction were excluded. Patients continued treatment until radiographic or clinical disease progression, unacceptable toxicity, withdrawal or death. Clinical progression was defined as the need for cytotoxic chemotherapy, radiation or surgical treatment for cancer, pain requiring chronic opioids, or ECOG performance status decline â‰¥3. Patient demographics were balanced between the treatment arms. The median age was 67 years. The racial distribution of patients treated with ZYTIGA was 69% Caucasian, 2.5% Black, 21% Asian, and 8.1% Other. The ECOG performance status was 0 for 55%, 1 for 42%, and 2 for 3.5% of patients. Baseline pain assessment was 0â€“1 (asymptomatic) in 50% of patients, 2â€“3 (mildly symptomatic) in 23% of patients, and â‰¥4 in 28% of patients as defined by the Brief Pain Inventory-Short Form (worst pain over the last 24 hours). Purple, oval-shaped tablets debossed with "AA" one side and "500" on the other side. White to off-white, oval-shaped tablets debossed with "AA250" on one side. Based on its mechanism of action, ZYTIGA may harm a developing fetus. Women who are pregnant or women who may be pregnant should not handle ZYTIGA 250 mg uncoated tablets or other ZYTIGA tablets if broken, crushed, or damaged without protection, e.g., gloves [see Use in Specific Populations (8.1)]. Inform patients that ZYTIGA is associated with hypertension, hypokalemia, and peripheral edema. Advise patients to report symptoms of hypertension, hypokalemia, or edema to their healthcare provider [see Warnings and Precautions (5.1)]. Inform patients that ZYTIGA with prednisone is associated with adrenal insufficiency. Advise patients to report symptoms of adrenocortical insufficiency to their healthcare provider [see Warnings and Precautions (5.2)]. Inform patients that ZYTIGA is associated with severe hepatotoxicity. Inform patients that their liver function will be monitored using blood tests. Advise patients to immediately report symptoms of hepatotoxicity to their healthcare provider [see Warnings and Precautions (5.3)]. Inform patients that ZYTIGA is taken once daily with prednisone (once or twice daily according to their healthcare provider's instructions) and to not interrupt or stop either of these medications without consulting their healthcare provider. Instruct patients to take ZYTIGA on an empty stomach, either one hour before or two hours after a meal. ZYTIGA taken with food causes increased exposure and may result in adverse reactions. Instruct patients to swallow tablets whole with water and not to crush or chew the tablets [see Dosage and Administration (2.3)]. Inform patients that if they miss a dose of ZYTIGA or prednisone, they should take their normal dose the following day. If more than one daily dose is skipped, inform patients to contact their healthcare provider [see Dosage and Administration (2.3)]. Inform patients that ZYTIGA may harm a developing fetus. Advise males with female partners of reproductive potential to use effective contraception during treatment and for 3 weeks after the final dose of ZYTIGA [see Use in Specific Populations (8.1)]. Women who are pregnant or women who may be pregnant should not handle ZYTIGA 250 mg uncoated tablets or other ZYTIGA tablets if broken, crushed, or damaged without protection, e.g., gloves [see Use in Specific Populations (8.1) and How Supplied/Storage and Handling (16)]. Advise male patients that ZYTIGA may impair fertility [see Use in Specific Populations (8.3)]. Do not take ZYTIGA if you are pregnant or may become pregnant. ZYTIGA may harm your unborn baby. Women who are pregnant or who may become pregnant should not touch ZYTIGA 250 mg uncoated tablets or other ZYTIGA tablets if broken, crushed, or damaged without protection, such as gloves. plan to become pregnant. See "Who should not take ZYTIGA?" are breastfeeding or plan to breastfeed. It is not known if ZYTIGA passes into your breast milk. You and your healthcare provider should decide if you will take ZYTIGA or breastfeed. You should not do both. See "Who should not take ZYTIGA?" Tell your healthcare provider about all the medicines you take, including prescription and over-the-counter medicines, vitamins, and herbal supplements. ZYTIGA can interact with many other medicines. Medicines are sometimes prescribed for purposes other than those listed in a Patient Information leaflet. Do not use ZYTIGA for a condition for which it was not prescribed. Do not give ZYTIGA to other people, even if they have the same symptoms that you have. It may harm them. without gloves (see package insert). 250 mg of abiraterone acetate. 500 mg of abiraterone acetate.